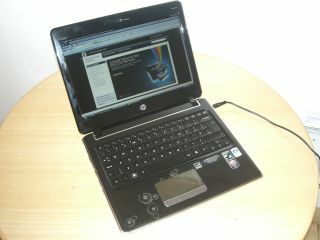 Since we first glanced at the HP dv2 at CES in January, TechRadar have wanted to get their hands-on HP's latest laptop which disguises itself as a netbook but performs like a notebook. Now the computer has landed in the UK, we have finally got that privilege. Straight from the off, the Pavilion dv2 is beautiful machine to use. Yes, it's diminutive in size but not so that it hampers performance. Its 12.1-inch screen is clear, brilliantly so for its size. For demonstration, we watched some HD footage of a snowboarder and it was pin-sharp on the BrightView LED screen, when played at 1280 x 800. When you watch video on the machine, it makes complete sense why HP has added an HDMI port. The dv2 also comes with an external DVD burner, which can be upgraded to a Blu-ray player if you are that way inclined. Even though HP has been slamming home hard that this is not a netbook, the laptop has the portable feel of its smaller brother – the HP 1000. The dv2 is light at 1.70Kg; extremely so, when you consider there's a normal hard-drive inside (160GB for the entry-level model, 500GB at its highest spec). On board is a 92 per cent keyboard that's a breeze to use. Keys are almost flush to the chassis, and it has the click and feel as if you are typing on a full-size model. When it comes to performance, the 'not-netbook' doesn't disappoint. Well, it doesn't if you opt for the fully specced model. The machine we tried housed 2GB RAM (this can be upgraded to 4GB) and was using Windows Vista Home Premium. Even with the memory sapping Windows Aero enabled, traversing Vista wasn't sluggish. The only problems we encountered was our finger sticking on the metallic trackpad. The lack of lag with Vista may have something to do with the AMD Athlon Neo MV-40 CPU. This new chip was made with ultra-portable notebooks in mind and is what AMD calls "a new spin on the existing product – in terms of power saving and performance." In fact, HP has exclusive rights to the chip all the way up toJune this year. A quick check at the performance ratings on Windows Vista, graphic performance was scoring a not-too shabby 3.4. As AMD has control of all the "major components" in the laptop, this is also meant to enhance battery power. The dv2 is quoted as having 5 hours' battery life. Although we could not perform extensive tests on the computer, HP's history of battery life isn't the best so this may have to be taken with a pinch of salt. When it comes to the chassis, the dv2 is shiny black. HP have called this colour 'espresso', while we think that's far-too much marketing speak for our liking it is a smart-looking machine. Be warned: it will need constant wiping to keep it free from fingerprints, as we found out rather quickly. Connection-wise, the dv2 houses a nice number of ports for its size. On the left-hand side there's two USB ports, an HDMI slot, DVI and Ethernet connection. Flip the machine to the right-side and you have an in-built memory card reader, microphone port, headphone port, one more USB and the power socket. When it came to closing the 'not-netbook' and handing it back (begrudgingly) to HP, you couldn't fail to be impressed with its size. At just 32.7mm at its thickest, you would have no problem carting the laptop around as you would a netbook. You just have to keep reminding yourself that it's NOT a netbook - but to do this, all you need do is turn it on. The entry level HP Pavilion dv2 is out now for £499. It comes complete with 1GB RAM, a 160GB hard drive and runs Windows Vista Home Basic. The higher-specced models are out in shops in May. These include 2GB of RAM and a 320GB hard drive for £599, or 4GB of RAM and a 500GB hard drive for £699. Both run Vista Home Premium. For more on the HP Pavilion dv2, check out T3's exclusive review.